At the start of every new month, we publish an update on our family’s net worth here on The Money Sprout. Tracking our net worth is a great tool that helps guide us towards financial independence (FI). Over the course of a month … we try and grow our assets. This includes our stock portfolio, cash, emergency fund, and even our kids college savings accounts. At the same time … we are also working to decrease our liabilities. For example, we have two car payments we make every month and a mortgage. The gap between how much in assets we have compared to what we owe is our net worth. Some months our assets go up … which raises our net worth. Other months we rely more on paying down our liabilities. Every little bit counts! Before we move on to reviewing our September net worth numbers, I would like to mention how we are using our Personal Capital account to do most of the work. 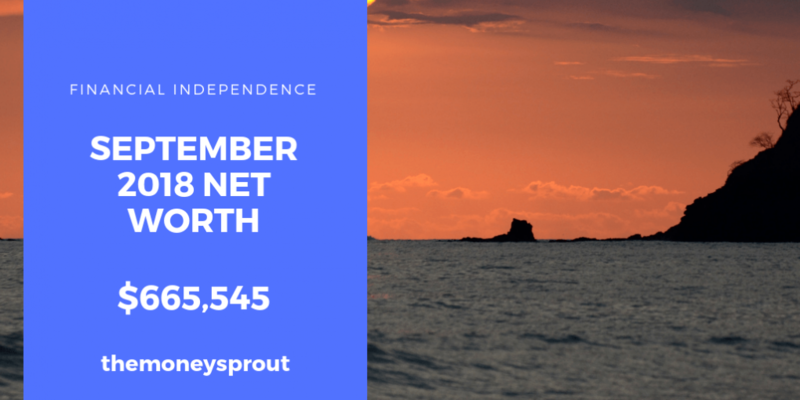 As of September 30th, 2018 – our net worth is $665,545. Overall, that is a very nice increase of over $10,000+ in net worth in one month. Our net worth in September 2018 increased by 1.59% compared to August. Our investment category includes a dividend income portfolio, 529 plans for the kids, 457 account, emergency fund accounts, IRA accounts, Roth accounts, and any other retirement account we have opened, etc. We have been building these assets for the past 10 to 15 years (depending on the account). During September our investments continued recent trends and rose again. Overall … our investment assets rose by over $5,000+ in September compared to August. That is another solid gain of 1.07% in value of our investments in the past month! Our current cash balance includes all of our checking and savings accounts. We don’t usually carry a high cash balance and like to move it into the stock market to purchase income producing assets. However, it is also important to have some cash on hand in order to cover unexpected expenses. Overall our cash declined by $185. Reporting home value in our net worth reports is good and bad. For example, we use Zillow to estimate on our home value. This is simply an estimate at best and may not represent the actual value we could sell our home for. That is the bad part of reporting it on our net worth. On the other hand, it is such a huge asset that not reporting it would skew our net worth results. We currently owe about 50% (maybe a little more) of the value of the home. That is a significant part of our overall net worth in my opinion. The estimated value of our home increased this past month compared to August. After a couple months of dropping in value, our home value rose by almost $3,000. Our biggest asset class (stocks) rose by over $5,000 last month. The cash balance we carry decreased by just ($185) and our home value rose by almost $3,000. Overall our total assets rose by just 0.98% since last reporting … which was a nice little increase. Overall this was a very successful month for growing our assets. There are 3 main liability categories that we will report on. The first and largest is our mortgage balance. Then we have our credit card balances … which is how we pay for almost every purchase we make. We have a 30 year mortgage on our home with a rate of 4.375%. If we paid the minimum (our mortgage payment) each month … our home would be paid off in 18 years. One way or another … we plan to not be paying on a home for another 18 years. We will either continue to pay a bit extra on the balance each month or downsize into a smaller home. We may even do a combination of both. Eventually we will likely downsize into a much smaller home in order to reduce our housing expenses … which currently makes up 38% of our monthly spending. If we could go back about 10 years, my wife and I would have purchased a much smaller home. We made a mistake and bought a home that was way too big. We could have lived comfortably with a 1,000 less square foot than what we have now. That move alone would have saved us thousands and thousands of dollars every year. We currently have two car loans. Our “family vehicle” (a van) has a very low 1.56% interest rate. This liability is referred to as “Car Loan #1” and will be paid off within the next 12 months … hopefully sooner. The second liability is referred to as “Car Loan #2” and has several years before it will be paid off. The awesome thing about this loan is that it is 0% … so we are not in a huge rush to get it paid down. Although I wouldn’t mind getting this debt off our books for piece of mind. During September … we saw another nice drop in debt on both of our auto loans. In total, our car loans pushed our net worth higher by almost $650! Almost every purchase we make (I would say 95%) is done so using a travel rewards credit card. Just in the past year, we have earned almost $10,000 towards future FREE travel. Check out our Travel Rewards page for up-to-date information on our pursuit for travel hacking. Our goal is to take a family trip to Hawaii in the next 3 years using these travel rewards. Our credit card balances fluctuate a lot month to month. During this past month’s snapshot, we managed to payoff a good chunk of our credit card debt. Since last reporting – our mortgage balance dropped, both auto loans dropped, and our credit card balances went down. The result of these decreasing liability balances is an increase in our net worth! Collectively our total liabilities decreased by over $2,225. When it comes to growing your net worth … decreasing your liabilities has the same impact as increasing your assets. 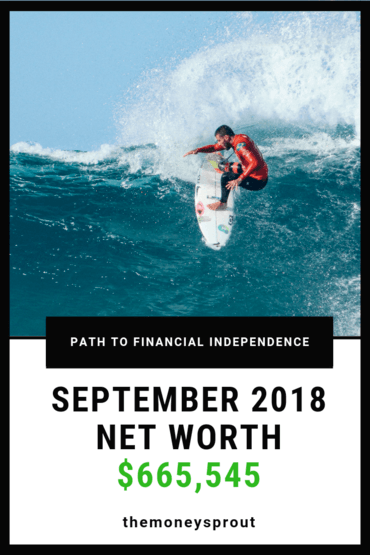 We plan to keep these net worth posts updated every month. Not only does it keep us accountable in how we save, earn, and invest … it is great motivation when you see growth like we have over the past 3.5+ years. For example, our first ever net worth report was posted back in March 2015 … which was 3.5 years ago. We reported a net worth of $434,984 back then. Now we are over $665,000 in new worth … which is a sizable increase in less than 4 years. We also realize the huge gains in the stock market have helped us grow our net worth. So we are getting close to 50% of the way. If it were possible to repeat the past 4 years, then we could reasonably hit our FI target within the next decade. I’m sure that isn’t going to happen as the stock market can’t keep on chugging like it has. But you never know. And if it does drop … then we can certainly load up on quality stocks and investments at a discount! Do you track your net worth? How did your September net worth totals turn out? What steps are you taking to widen the gap between your assets and liabilities?